Kaiya Kitty's Weblog | Brilliant thoughts from a highly intellectual cat, of course. But I know where to find warmth. Alex and Jeremy came to stay with us for a few days for Christmas. That was great, but they brought Angus with them. I don’t much care for dogs. He had to be put in his place and I let him know this was MY house by hissing at him. Even though he is a lot bigger than me, he was scared of me. Ha! He was so goofy – barking and chasing after a flashlight beam. A waste of energy. Mommy seemed to really like playing with him and petting him. Said she missed playing with a dog. She must be losing her mind. Despite what you may have heard, I did NOT do this! Mommy and Daddy are making a huge mess in my house and I am getting tired of it. Dust on my fur, pieces of paper on my back. And I am sneezing a lot. Plus, I am not getting the attention I deserve because they are too busy tearing the house up so they’re not sitting and holding me as much as they should. I’m getting the raw end of the deal here. Don’t you just LOVE boxes??! They are fun! I like to hide in them. O.k. 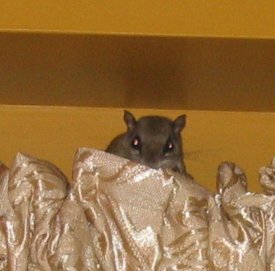 – there is a rumor going around that I did not do my part in helping to capture the flying squirrel that was in my house. Mommy and Daddy said I was worthless and had no killer instinct. Well, I’m here to tell you that when Daddy held me up to this creature so we were face-to-face, I just didn’t feel it was that serious. My time was better spent out in the garage, guarding to make sure that no more critters entered the house. Plus, I had to eat dinner. Geez! What do they want from me?! I was protecting Mommy and Daddy and this is the thanks I get. Hmph. I am continuing to monitor the situation to make sure there aren’t any more. The window seat in the kitchen is just not working out. It’s not nearly soft enough for my delicate body. I just like boxes. They are warm and soft and…..well,….I just like them. 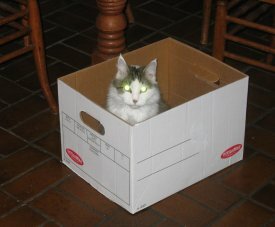 Lately I have been exploring actually sleeping IN a box. It’s fun! Now I have a new spot to hang out. Mommy found me sleeping on the dining room table and yelled at me again. 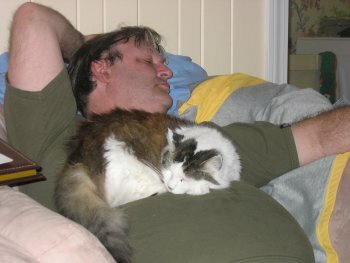 Something about “cat stew” and me being a dead cat. What’s “dead?” Anyway, she cleared off a spot on the kitchen window bench and put my blue towels up there and now that is where I try to hang out. 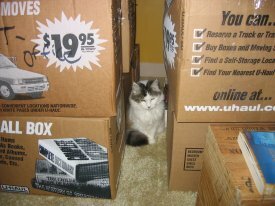 It’s hard because there are so many boxes and furniture and things I can climb and jump on. How am I supposed to know what I can sleep on and what I can’t?? Besides, as long as I look cute, what does it matter? So, now that I don’t have the box in the dining room any more, I found a new spot. On top of the kitchen table. I was sleeping there and minding my own business when Mommy came home and found me there. Boy, did she get mad! She was saying stuff that I probably am too young to be hearing and was shaking her finger at me. What’s up with the finger shake thing? Geez. She takes away my favorite sleeping spot and then yells at me for finding a new one. Humans.